Since last three decades, Hermès was welcoming Londoners at 179 Sloane Street. While Hermès opened its first boutique in Chelsea in 1987, the luxury French fashion house has relocated to a new address in 2017. Though just a stone’s throw away from the original boutique, Hermès’ new home expands twice in size to accommodate the entire Hermès universe. 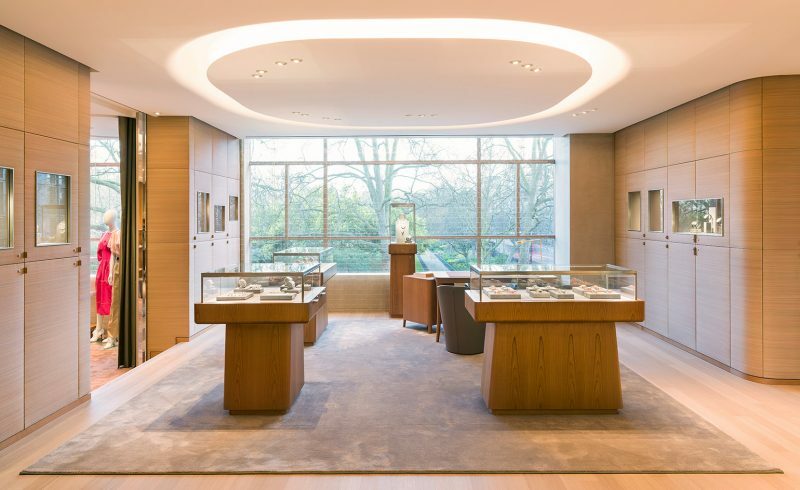 Shifting just 500 square feet on Sloane Square, Hermès has pulled out all of the stops to make an impressive presence felt on the corner of Cadogan Place and Sloane Street. The building’s facade was originally designed by Michael Rosenhauer, the man also responsible for the Hermès flagship on New Bond Street. The mosaic-tiled entrance of the 400 sq m store is stamped with the signature motif below a double-height ceiling. Hermès motif in the grey and gold mosaic flooring also welcomes the well-heeled shoppers. Sporting soft curves and warm metals, the opulent boutique pairs brand heritage with modern elegance. A Yamaha Virago motorbike, covered in Hermès leather, is on display for the first time in the UK as an example of le sur-mesure services available at the store. Spread over two floors that are connected by a grand, undulating oak staircase, the store is home to every one of Hermès’ 16 métiers. Luxury quotient is raised by cladding the the handrail of the staircase in Hermès Etoupe leather. 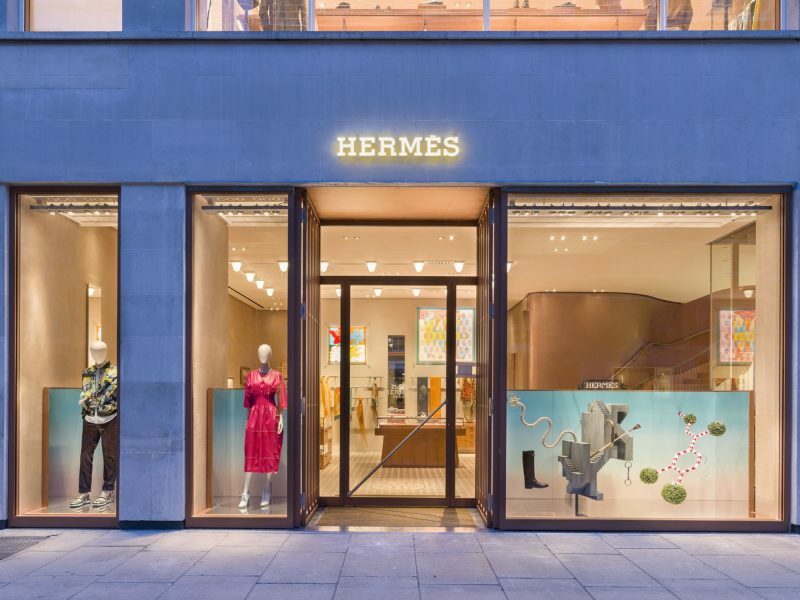 Staying loyal to its heritage and partners, Hermès teamed up with longstanding collaborators RDAI Architecture, who have has created over 300 store designs for Hermés over the course of 40 years, to do the new store’s interior. Boasting of unique features and architectural elements, the store is designed such as to do full justice to the Cadogan Square Gardens outside. Even the existing staircase was shifted to face the window and a glass lift has been installed to render the beautiful view of nature’s play with colors and patterns while shifting through the two levels. Subtle metallic mesh curtains fitted on the large landscape windows offer privacy without obscuring the unique view from within. As the sun sets, the mesh creates a beautiful warm glow onto the street outside. 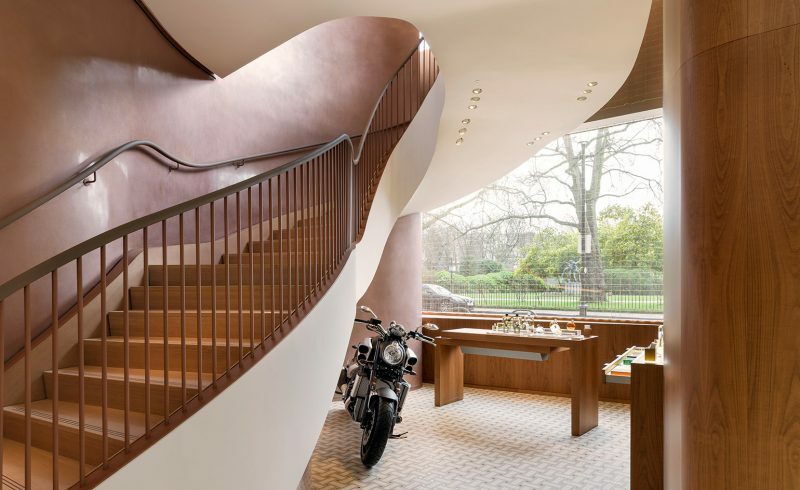 The ground level leads to the silk and fashion accessories departments to the left side while the equestrian collection is housed in an intimate space with rounded wood walls. Fragrances comfortable nestle under the curve of the oak wood staircase. 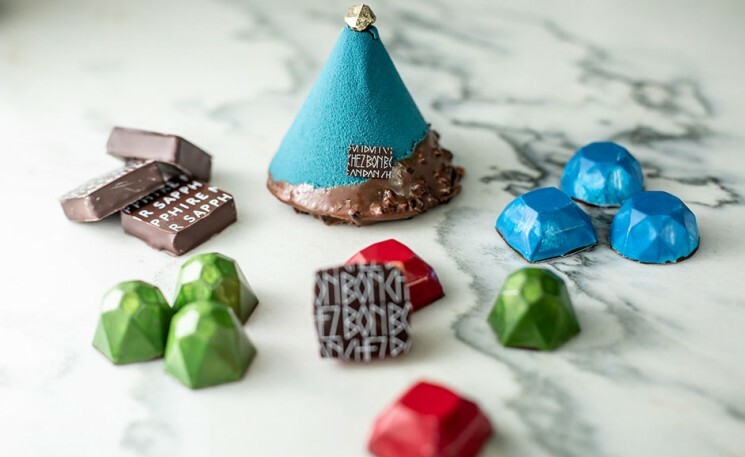 The men’s and women’s ready-to-wear, shoes, hats, jewelry and watches, gloves, belts and Maison and Art de Vivre collections are laid out across distinctly on the top level. Featuring a subtle palette of copper-colored silk carpets, lacquers, warm-colored metals wood and leather, the new London store showcases a range of exclusive products including the re-issued London Bag in four limited-edition colorways.